On new construction or when inspecting an existing HVAC system that will include an EWC Controls Zoning system, you must determine if the duct is correctly sized to handle the volume of air delivered from the HVAC system. You should also determine if the HVAC system was sized correctly for the home or building. In order to do all of that, a load calculation should be performed. Once it has been determined that the HVAC equipment and the duct work are correctly sized, then you may install an EWC Controls Forced Air Zone System. Otherwise, HVAC equipment and duct-work issues should be addressed prior to installing an Air Zone system. EWC provides Zone System Design Guidance that predates and supplements the new ACCA Manual Zr or if you prefer, use the ACCA Manual Zr for design guidance. If possible, specify Modulating or Multistage HVAC systems when zoning. This allows the zone system to match System capacity to the Zone demands. Select the correct Zone Control system for that HVAC system and the number of zones you want to create. Consider Timer staging or Thermostatic staging. If necessary, modify the existing duct and/or install new duct that has been sized at a friction rate that will accommodate higher Cfm volumes at normal static pressures and normal velocities. (Use ACCA Manual D to size your duct-work or use a duct calculator and select .07 friction rate instead of the typical .10). If possible, install Dampers in the Branch Runs, rather than Duct Trunks. Now you can select which branch runs to damper and which runs to leave alone (Open Runs). 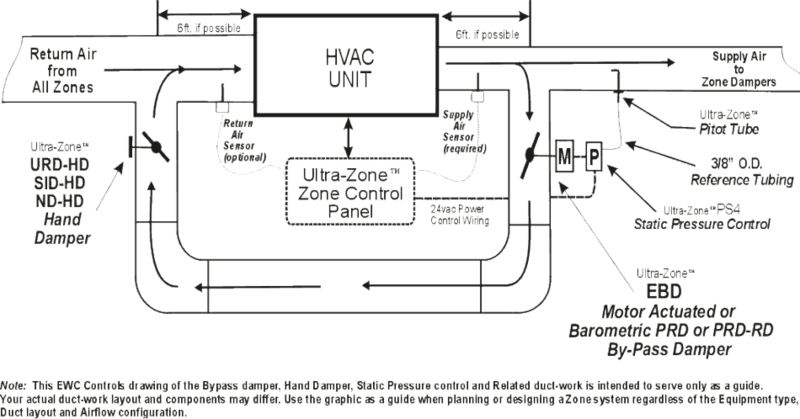 This method provides airflow to certain areas every time the HVAC system operates. (Bathrooms, Foyers and Washer&Dryer areas should not be dampened). Dampening on the branch runs is more costly than on duct trunks. Allow the Zone dampers to leak 10 to 20% air volume when closed. This small leakage can offset the heat gain or heat loss in a particular zone and reduces bypass volume. Large zones can leak more air than small zones. Install a Modulating Bypass Damper, Route the bypass air back to the return duct or to a rarely used area of the home. The Bypass Damper is the most common tool available to manage airflow and static pressure in a zoned HVAC system. Install a Balancing Hand Damper in the Bypass Duct. The Balancing Hand Damper allows you set sufficient Pressure Differential across the bypass duct, preventing the bypass duct from being the path of least restriction. Balance the System. All HVAC systems needs to be balanced and an air zoned system is no exception. Use the Zone damper itself to restrict or allow more flow to a particular zone and/or install balancing hand dampers in the branch runs. 100% of the equipment rated airflow (Cfm) must flow through the HVAC system at all times. Do not restrict return airflow back to the HVAC system. Do not create numerous small zones. Two to four large zones works the best. Too many small zones makes it more difficult to manage airflow. Try to create zones using areas & rooms with similar heating and cooling loads. Do not combine rooms with drastically different loads. When sizing the bypass damper, assume the worst case scenario which is the smallest zone may be the only one to call at any given time. EWC Controls always recommends using the Electronic Bypass Damper (Part# EBD) on all zoning installations, although Barometric Bypass Dampers (Part# PRD and PRD-RD) work also, but are not as precise. Install a balancing hand damper in the the bypass duct to slow the bypass air down and achieve a slow mixing of bypass and return air. Use the Zone Damper’s travel limit adjustment and set up to 20% leakage on large zones. Smaller zones can be set lower or have no leakage at all. Always use the SAS (Supply Air Sensor) to prevent the supply air temperature from rising too high or falling too low. Timed or Thermostatic staging depending on preference & budget. 50% Rule will inhibit Y2 until a sufficient number of zones are active. Outdoor Air Sensing to inhibit Auxiliary operation in mild weather. Return Air Monitoring will allow or prevent stage up operations. Communicating Zone Control systems can minimize bypass flow. The most common tool for managing excess air volume in a zoning system is the Bypass damper. This is done by tapping into the supply air plenum, installing a Bypass damper and Balancing Hand Damper, which allows you to route the excess air back into the return duct, or divert the excess air into a rarely used area of the home that has an open return grille. The Bypass graphic below reflects bypassing into the return duct. Use and reference this graphic diagram when planning and designing a system. When tapping back into the return duct, the tap is recommended to be at least 6 feet away from the equipment if you have the room and clearance. This is done to ensure that the hot or cold air coming off the plenum has ample time to mix with the return air before going across the coil again. In addition, a Balancing or Restricting Hand Damper should be installed in the bypass duct. It’s the perfect way to ensure sufficient restriction of bypass air-flow and proper mixing of Bypass air with Return air. Supply Air Temperature Sensors are mandatory when you install an Air Zone system. The sensor will protect the HVAC equipment heat exchanger from overheating and the DX coil from freeze-up conditions. EWC Controls includes the Supply Air Sensor (Part# SAS) with every micro-processor based Ultra-Zone control panel. If the bypass method is used either exclusively or along with other tools, the bypass duct should be sized to manage the airflow and volume under the worst case scenario, which means the smallest Cfm zone may be the only zone calling at any given time. That scenario will cause the most volume build-up. The calculation is done by taking the total Cfm capacity of the smallest zone and subtracting that number from the total Cfm delivered by the HVAC system. If you have airflow from Damper Leakage and Open Runs, subtract that also. As stated previously, there are several tools you may use to manage excess air volume. EWC Controls recommends using at least two or more of these tools in order to effectively manage airflow and volume on any Air Zoned system. Use the Bypass Graphic as a guide when designing your systems. Doing so will save you valuable time and labor. Contact EWC Controls for Technical Support if you have any questions or concerns. EWC Controls will help you make all of your zoning installations Excellent Without Compromise.